The Whoojackpot tribe has lived in the casino for many generations, living off of the land by playing craps and blackjack. Click here to play! They have tales that tell of an outsider who would come in search of a Golden Goose and then win big on the slot machines, but it has been so long since any visitor has found the Whoojackpot tribe that they have begun to lose hope. You have stumbled on this tribe of professional gamblers, however, and now they are putting you to the test on their most sacred of slot machines: the Golden Goose - Totem Treasure slots! 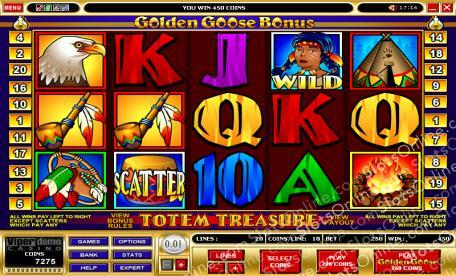 This challenging game requires you to place a special bet to play for the Golden Goose bonus, and a massive jackpot is won for scoring 5 Wild Squaw symbols on the same payline. Are you the prophesied one who will win the jackpot and find the Golden Goose? You'll have to play to find out. The Scatter Drum symbol pays out on the total bet when 3 or more land on the reels. 3 symbols payout 8 times the total bet, 4 symbols payout 30 times the total bet, and 5 symbols payout 400 times the total bet. The Wild Squaw symbol can substitute for any symbol other than the scatter symbol. It doubles the wins of any combination that it completes as a substitute. When the Golden Goose bet is made, there is a chance of the bonus activating once the spin has completed. 4 games are available to be played in the Golden Goose bonus. These games are: the Golden Egg Bonus, worth up to 2,000 coins, where the player is awarded a random bonus amount; the Golden Reels Bonus, which has the player choose an egg on each reel to reveal bonus prize amounts; the Money or the Egg Bonus, where the player chooses the Money to get a random prize value, or the Egg to get a random number of free spins at a random prize multiplier; and the Pick a Card Bonus, where the player must choose a card to win from 2 to 11 free spins with a 6 times prize multiplier. Autoplay can be set for up to 500 spins. It may also be set to stop on a win of a certain amount. The side bet is always made.